For starters....don't forget to check out this post and leave a comment on this post to win the Delta Magazine Cookbook! Fricassee might be my most favorite word to say. It also might be my new favorite crock pot meal. I ate the left overs every single day last week and never got tired of them. This is rare as I usually get over a left over pretty quick like. I can't tell you much about fricasee. I attempted to do some research just now but almost started snoozing when they started to talk about braising. 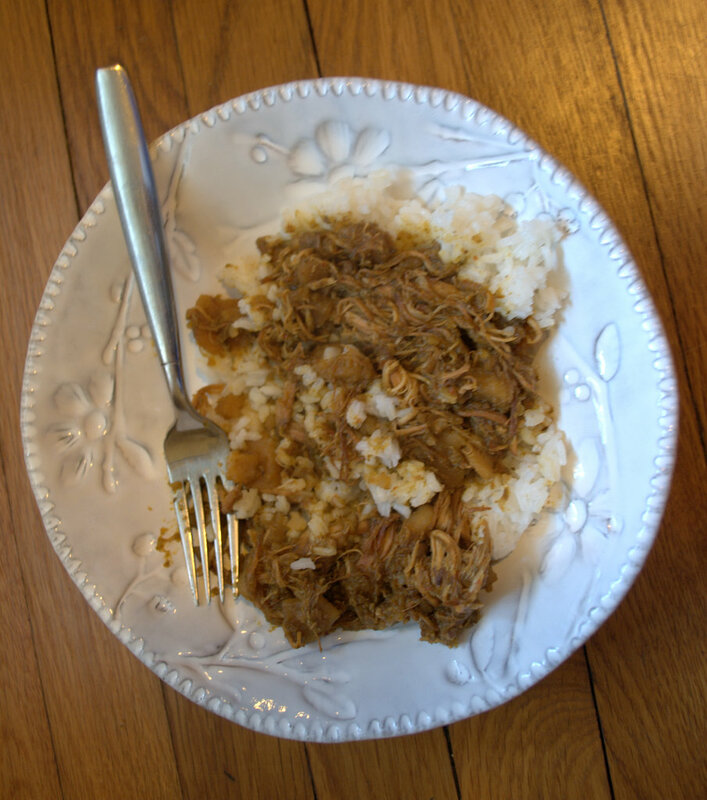 The recipe that I used claims to be the traditional way to make fricasee in Puerto Rico. I'm not sure about all that. I'll just say that this is an exciting dish that uses some ingredients that you probably don't have in your kitchen....like sazon and adobo. But get out of your comfort zone, try something new, embrace the fricassee. Place the chicken in a large bowl, season with the sazon and the adobo seasoning. Place in a crock pot. Place the sliced potatoes atop the check. Combine the bell peppers, onion, garlic, olive oil, wine, cumin and oregano in a bowl and blend with a hand blender. Or you can just use a regular blender. Whatever. Pour over the potatoes. Add the bay leaf. Cook on low for eight hours. Chicken should fall apart for easy measuring. I enjoyed this a few different ways. Atop white rice, wrapped up in a low carb tortilla with a wedge of laughing cow cheese...the possibilities are endless! !